Autism Spectrum Disorder (ASD) is a complex disorder typically characterized by social impairment and communication deficits, and most recently the CDC has estimated that 1 in 88 American children are affected by a form of ASD.1 A reliable diagnosis for autism can be offered at 24 months, but most children are diagnosed later after attending school. 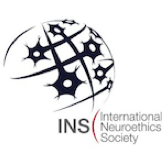 For the first Neuroethics journal club of the spring semester, ILA graduate student and Neuroethics Scholar Jennifer Sarrett led a discussion on a new technology that could offer preclinical risk assessment in children as young as 2 months. Even though children and adults with autism exhibit a wide variety of individual and unique symptoms, a common attribute of those diagnosed with autism is a deficit in the ability to make eye contact. In a paper published in Nature late last year, researchers from the Marcus Autism Center and Emory University School of Medicine used special eye-tracking equipment to measure eye fixation in children only 2 months of age and were able to observe the earliest signs of developing autism ever recorded.2 Infants that were enrolled in the study were measured at 10 different time points between the ages of 2 months and 24 months, and then an autism diagnosis was made at 36 months. Infants were classified as either high-risk for ASD if a full sibling had already been diagnosed with ASD or low-risk if no first, second, or third degree relatives were affected by the disorder. Eye-tracking was analyzed at each of the time points for 36 boy infants, 11 of which were later diagnosed with ASD (10 from the high-risk group and 1 from the low-risk group) and 25 of which were classified as typically developing. 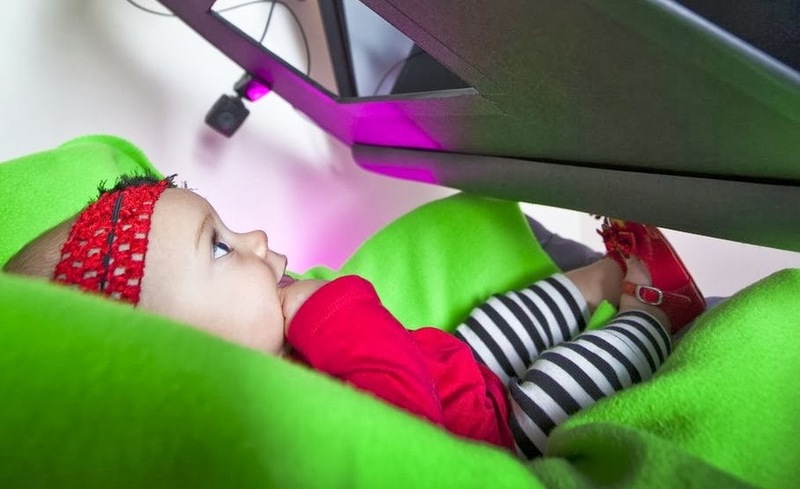 At each of these time intervals, infants watched videos of a caregiver behaving in a natural, standard manner, and the amount of time each infant fixated visually on the eyes, mouth, body, and objects in the room was measured. It was hypothesized that in the children later diagnosed with autism, a deficit in the attention given to the caretaker’s eyes would be observed beginning from the earliest time point measured. 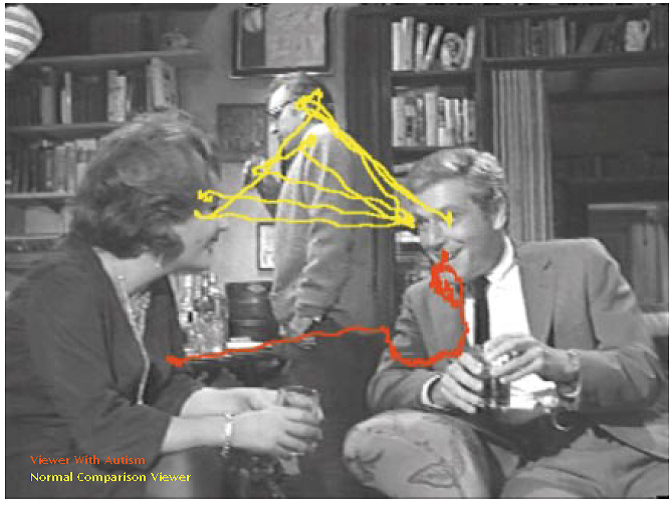 In 2002, the first study of this kind to use eye-tracking equipment to research autism was conducted.3 Male adolescents with autism and males that had not been diagnosed with autism were recruited to watch 5 clips from the 1967 movie “Who’s Afraid of Virginia Woolf,” chosen due to the socially intense interaction of the four main characters.4 The movie includes many highly complex social situations that would warrant a viewer’s fixation on a character’s facial expression and bodily actions. While those in the study watched the clips, eye-tracking equipment was utilized to track visual fixation of the two groups. Individuals from the autism group were more fixated on the mouth region, the body region, and object region than their peers that had not been diagnosed with autism. The largest difference in visual fixation was that of the eyes though; those from the autism group fixated 2 times less on the eyes and this was the best predictor of which study group an individual was associated with. A new technology that has the potential to be used as a screening tool for autism would be incredibly helpful for the field, since it has been shown that early diagnosis and early therapies can improve a child’s delayed development.5 However, therapies for autism including speech and language therapy, usually occur between 12 and 18 months, at the earliest. If risk assessment is made between the ages of 2 and 6 months and the only obvious symptom is declining eye contact that has been made with specialized, sophisticated technology that currently is not even used in a clinician’s office, what therapies would be utilized and what development skills would therapy target? The earlier autism is detected, the better for the child, but is it also possible that there would be an age where the diagnosis would be unnecessary, or even detrimental? As this new technology is more widely used and if the results are confirmed in a larger population, researchers are more likely to develop intensive therapies for infants in an effort to rehabilitate children who show signs of autism at a very young age. ASD can be expressed in children and adults in a variety of forms with varying levels of severity. While parents of a severely autistic child who is unable to communicate would most likely appreciate intensive therapies given at a young age in an effort to lessen the effects of autism, many advocates of neurodiversity would rather find ways to accommodate and help those afflicted with autism and not find new methods for extreme rehabilitation. Proponents of neurodiversity often believe that many neurological disorders, such as ASD, are a natural result of the genome and neurodiversity is crucial to society.6,7 Attempts to eliminate all autistic expression from children using early-intervention autism assessment or therapy would go against the tenets of neurodiversity and be seen as completely unnecessary. The idea of neurodiversity and how neurodiversity applies to autism is a complex idea, in part because autism is such a diverse disorder. No two children with autism behave the same or are affected at the exact same level of severity. As researchers and clinicians move forward with very early therapeutic interventions and even earlier risk assessments, children will have to be considered individually. Screening for autism at an infant age may be useful or even necessary for children with a high-risk for autism, and based on the results, it may not be advisable to wait until a child reaches 12 to 18 months to start therapy. While researchers observed that a steeper decline in visual eye fixation was related to a more severe social disability, results also suggest that initial visual fixation to the eyes following birth into the first couple of months of life is not reliant on whether or not a child has autism. This offers the hope that there are more therapies for autism to be explored – those that build on a neural foundation and normative social behavior observed in infancy, and not necessarily a remedial program that works to adjust social behavior and visual fixation deficits. 2) Jones, W., Klin, A. (2013). Attention to eyes is present but in decline in 2-6-month-old infants later diagnosed with autism. Nature 504, 427. 3) Falck-Ytter, T., Bölte, S., Gredebäck, G. (2013). Eye tracking in early research. J Neurodev Disord 5, 28. 4) Klin, A., Jones, W., Schultz, R., Volkmar, F., Cohen, D. (2002). Visual fixation patterns during viewing of naturalistic social situations as predictors of social competence in individuals with autism. Arch Gen Psychiatry 59, 809. 7) My Life With Asperger's. Psychology Today. Retrieved on January 28, 2014 from http://www.psychologytoday.com/blog/my-life-aspergers/201310/what-is-neurodiversity.